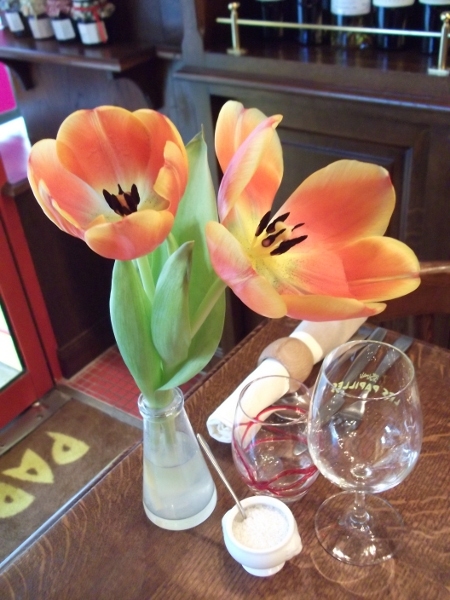 Les Papilles translates to “tastebuds” and this bistro is certainly focused on your tastebuds whether it’s for food or wine, they put as much care into one as the other. The philosophy of the venue is to “thrill your tastebuds” and besides being a bistro, they also double as a wine shop and delicatessen. 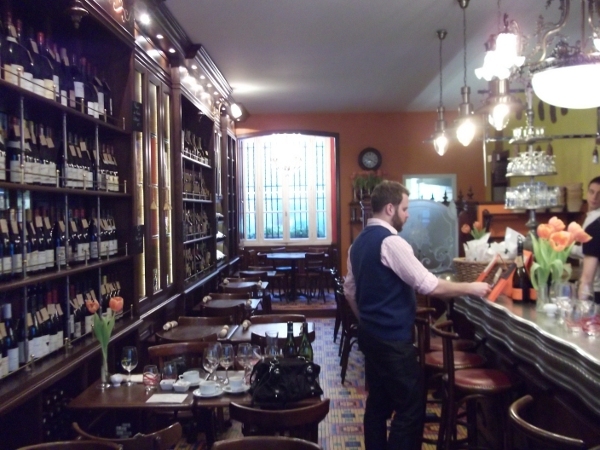 At first glance, I thought it was a food shop but walking in, we encountered a full, bustling narrow dining area, on one side a long bar, on the other a wall of wine and in the middle a long row of tables for diners. They have an ala carte menu with classic French dishes, including foie gras and escargots as well as selections of ham to start and cheese to finish. The lunch menu is reasonably priced with most entrees €13 – €16. 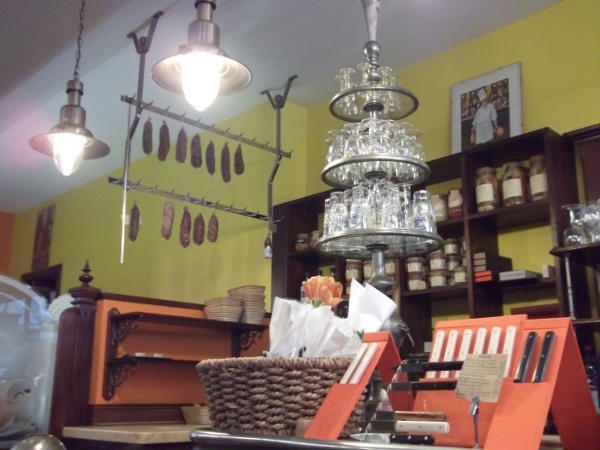 They also have a “retour du marche” menu which is the Chef’s seasonal menu. As I was with friends who speak French ( and I don’t), I didn’t know what was going on, but turns out we opted for the set menu (€33) of four courses, which was a lot of food! 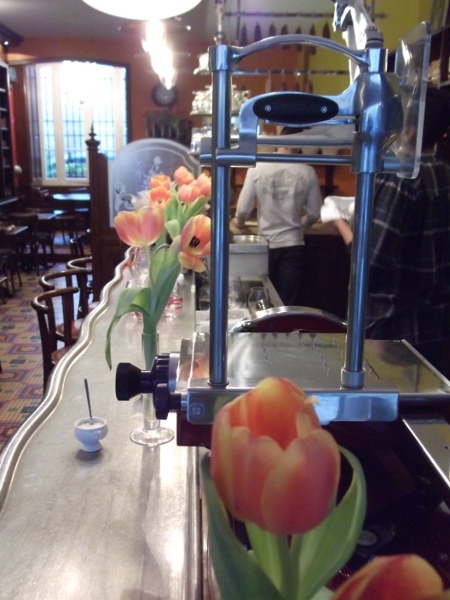 They do however, speak English and will cheerfully help you with both the food and wine lists. The fun thing about going to this bistro/winebar is that you can pick you bottle off the rows of wine lining the walls. They charge a modest corkage fee of €7 euros for a bottle off the wall with prices starting at €25. They do have house wines as well which start at €4.10 for a gls and €13.50 for 50 cls. The wines they offer are chosen to reflect their terroir and what they believe is the true character of the wines, so cue plenty of small producers alongside the more well known ones. There is a wine list but we preferred checking out the bottles from the wall. After much browsing, we settled on a white Bourgogne to start and a St. Joseph for the main. 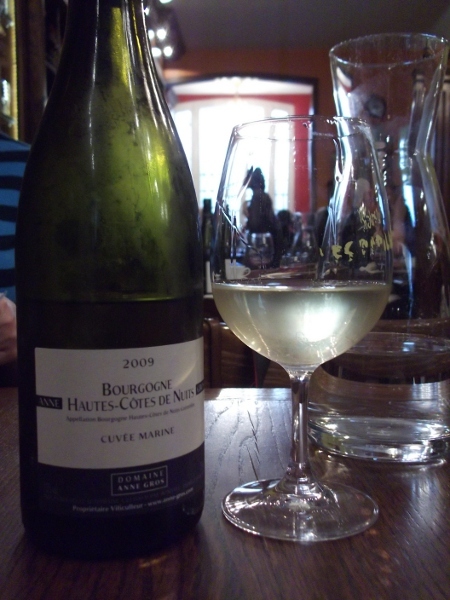 Domaine Anne Gros 2009 Bourgogne Hautes Cotes de Nuits Blanc Cuvee Marine (€25) a small domaine but well respected, Anne Gros started in 1988 but has quickly become a major player in Burgundy. She uses biodynamic and organic practices in the vineyard but doesn’t certify the vineyards as such as she doesn’t want to be limited by any constraints in her winemaking. The wine is fresh and clean with lemon and hints of tropical fruit amongst the mineral notes flecked throughout the wine, excellent structure, creamy with a long finish. 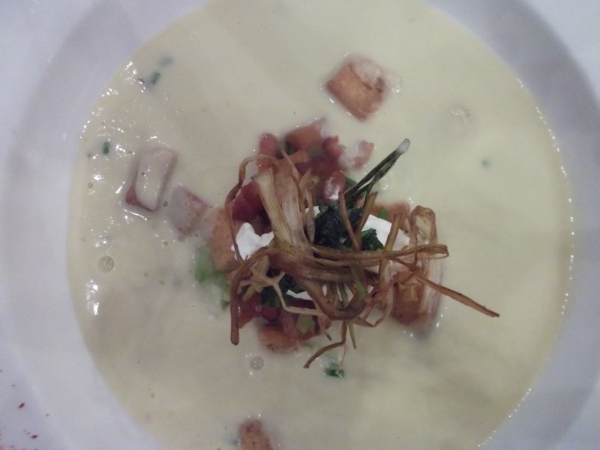 We drank it alongside the leek and potato soup which was velvety smooth, not too stodgy nor too runny and the bits of lardons, croutons and fried slivers of leeks floating about made a tasty starter. Since we all ordered the menu, our lunch was served family style, with each of us taking it in turns to ladle out more whenever our bowls went empty. 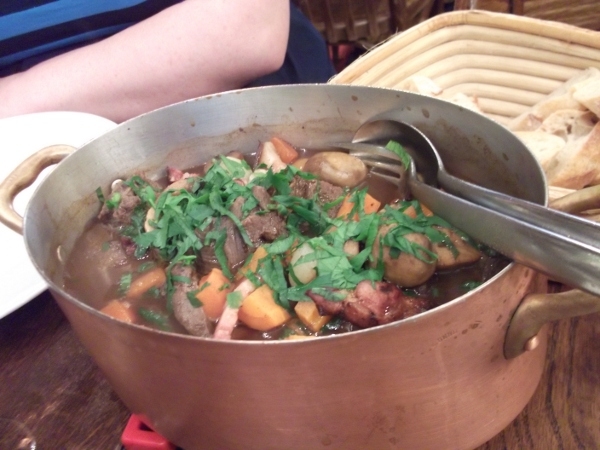 Our main of slow cooked beef cheeks were done to perfection, I could have cut through the meat with a spoon, served in a red wine sauce, rich and thick with flecks of bacon, round baby potatoes and carrots. Paired with the Pierre Gaillard Clos du Cuminaille St. Joseph 2006 (€35),full of blackberries on the nose, following through on the palate with licorice and black pepper notes, I found it to be quite meaty and savoury, it’s another biodynamic/organic (uncertified) wine. 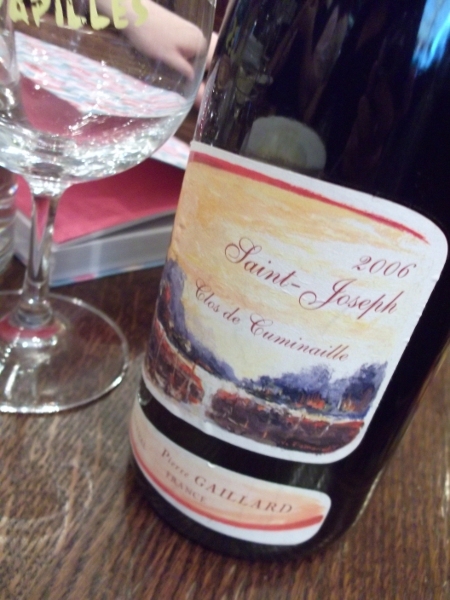 And, good news, the Gaillard St. Joseph is available from Berry Brothers & Rudd, the 2007 though, not the 2006. 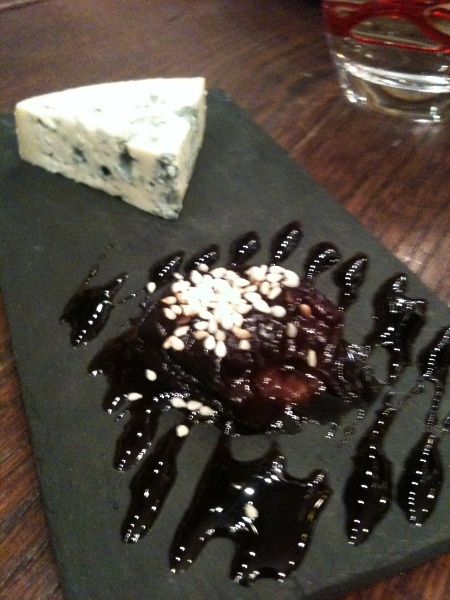 We stuck with the St.Joseph for the cheese course, Forme d’Aubert with date in a red wine reduction. Not bad but tawny port probably would have been better. By this time we were heading into dessert, a pannacotta with apples topped with a salted caramel foam. I switched back to the Bourgogne and wow! much fruitier the second time around. I would have liked to have seen what sweet wines they had by the glass but by this time I was struggling to finish and we still had a dinner to get to later that evening. 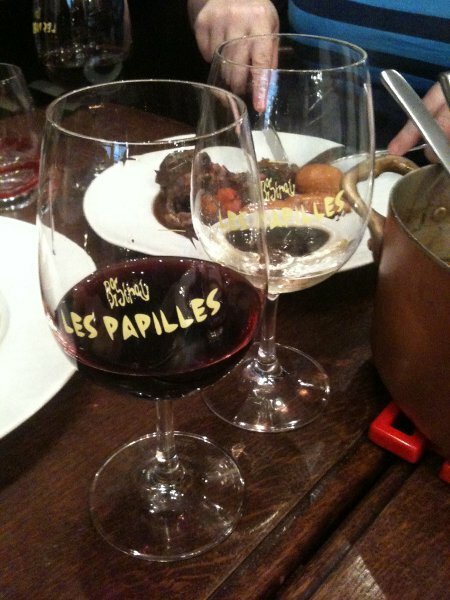 I would certainly like to go back to Les Papilles and this time explore la carte de vins et les vins du moment. The place is always packed and we could only get a 2pm lunch reservation so if you’re planning on going, be sure to book in advance. I’m heading back to Paris in a few weeks so we shall see…. I like tulips even more then they do! Don’t remember what you had? Why do you think I take so many pics? 😉 Thanks for recommending Les Papilles, any more recs? Going back to Paris next week.